Electronic Arts began their keynote by enthusiastically stating how they don’t have “random celebrity guests” but only games. Mass Effect 3 dated, March 6th, 2012. Need For Speed: The Run announced. There are out-of-car gameplay segments. The Sims Social announced. Play out Facebook events in the Sims. Just seen the Ubisoft Press Conference E3. Some great stuff to come. First, the launch of Assassin’s Creed Revelations in November. Then, Rayman which seems great. Take a look at the demo here-below. Interesting new concept called Rocksmith and you can plug your own guitar. I really want to test it tomorrow at E3. Rabbids on Kinect uses augmented reality to bring the Rabbids into YOUR home. Party games, 4-player co-op and online picture sharing. I don’t forget Tom Clancy’s Ghost Recon – Future Soldier, which is very promising. Kinect will be used in this Game, to customize your weapons as example. Tintin is coming. As Belgian, I’m proud of this. Your Shape for Kinect looks great and this is the perfect game or ideal sport coach for my wife. Just dance 3, also available on Kinect seems very cool. My doughter will be happy to test it. I had the chance to be, this morning, in the Xbox 360 Media Briefing @ E311 – Los Angeles. The show started with a cool demo of Call of Duty Modern Warfare 3. Then, we saw a demo of tomb raider. We discovered the Voice recognition Kinect on Mass Effect 3 and how Kinect (thru voice recognition) could influence the scenario of the game. For Clancy’s Ghost Recon Future Soldier, you can use KINECT to tailore your weapon. Amazing demo. I really want to test it. All future titles in this franchise will leverage Kinect. Xbox Live is also changing. Tomorrow, you will use your voice to access your music, games, video. Youtube is coming to Xbox Live. Bing is going to come to Xbox Live too. You can search games thru Bing. You say it, Xbox finds it. Look at Demo Bing here-below. Disneyland Adventures is a Great game to experience Disneyland Parc’s Attractions. This will be Available this Holiday. My kids will be happy, I’m sure. Kinect Funlabs will be available for Xbox Live Members. You can create avatar like you. Amazing demo. Kinect finger tracking is also coming. Kinect Sport Season 2. 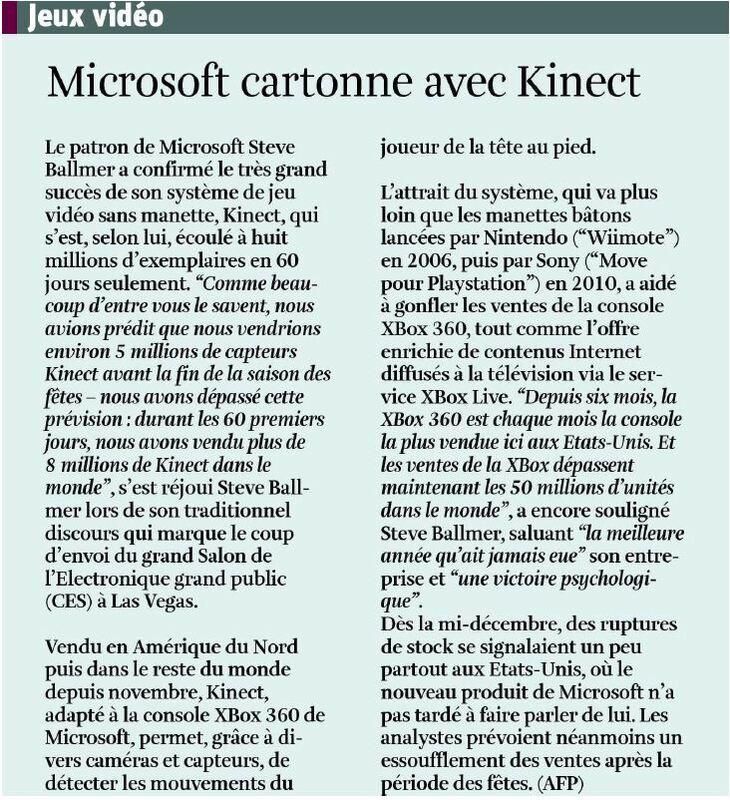 Top franchise of Kinect today. That’s clearly a game for my parents who can play Golf and other games. 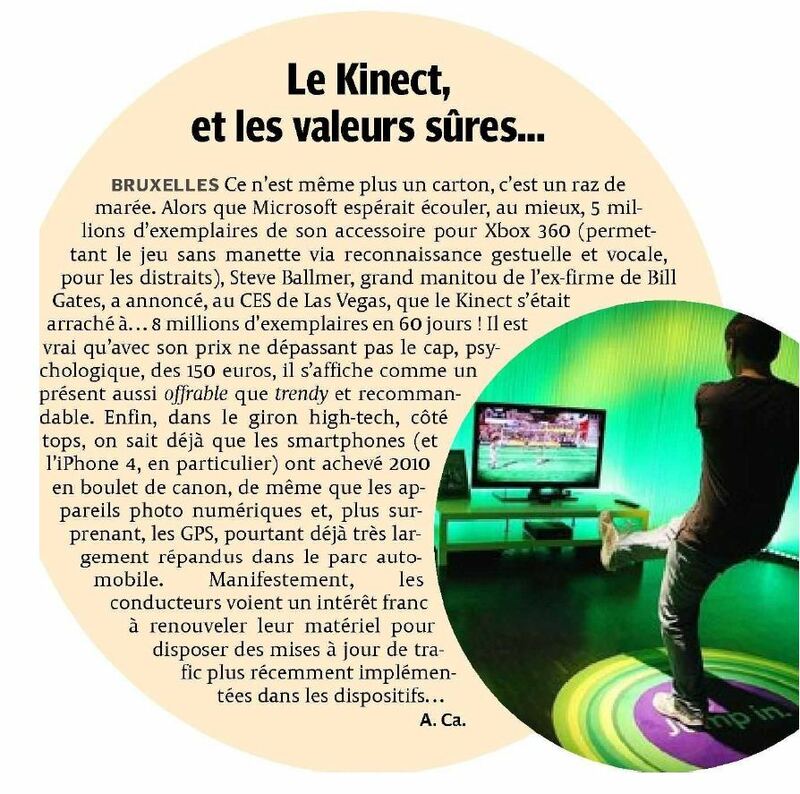 New Guinness World Record for Kinect, THE Fastest-Se​lling Consumer Electronic​s Device EVER ! Microsoft Belgium moves back to the first place in the Employer of the year ! Best Workplaces rankings are part of the largest study of workplace excellence and people management practices in Europe, reflecting the workplace experience of over 1.1 million employees across Europe. According to the organizers a “great place to work” is one in which you “trust the people you work for, have pride in what you do, and enjoy the people you work with.” Co-founder Robert Levering put forth this definition in his 1988 book, A Great Place to Work: What makes some employers so good – and most so bad, based on interviews with hundreds of employees at dozens of companies. Twenty-three years later the same definition holds true. Microsoft Belgium has been in the list since 2003 (except 2005/6 when we didn’t participate) and we’ve been able to maintain a top position in the list for all these years. Full Great Places to work press release in NL en FR. Nice coverstory in Vacature/Références on Best Employer.